The building will be designed by Morris Adjmi, who is known for his work at the Wythe Hotel in Williamsburg, the Theory Building in the Meatpacking District, and the Scholastic Building in Soho. In true Adjmi fashion, Front & York will draw on the architecture of its surroundings for inspiration. Arches on the ground floor are said to be inspired by the spandrels of the Manhattan Bridge while the facade echoes the neighborhood’s industrial warehouses. The development boasts a generous and luxurious amenities package including an underground parking lot with space for 712 cars, a private park designed by Michael Van Valkenburg Associates—who planned the nearby Brooklyn Bridge Park—a lounge, kids area, screening room, and rooftop swimming pools. Outside, the building will be framed by wide, tree-lined sidewalks to create a plaza-like feel. 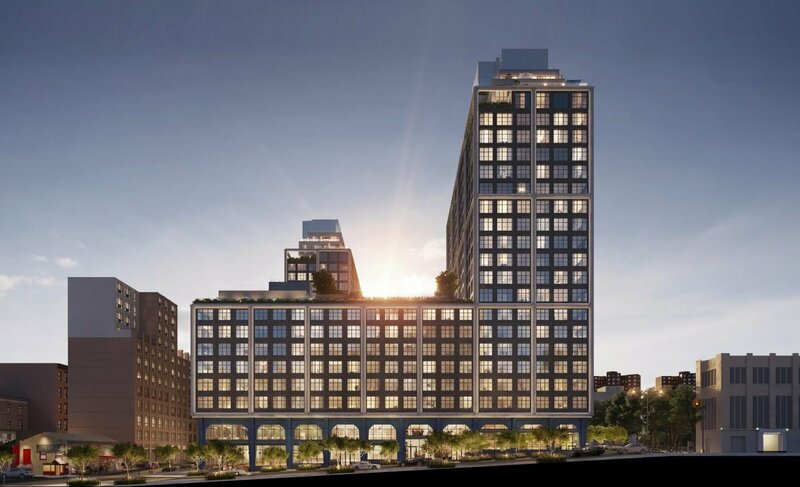 The development started as a joint venture by Los Angeles-based CIM Group (one of the most active real estate developers in Brooklyn), Brooklyn-based LIVWRK and Kushner Companies in 2016. The three developers purchased the site for $345 million from the Jehovah’s Witnesses. Kushner sold its stake to CIM in 2017. Construction is slated for completion in 2022 and new details about the building will be released toward the end of this year.